This blog post introduces some common terminologies related to safety, and then moves on to the intricacies of it. Hazard: A hazard is anything that may cause harm, such as chemicals, electricity, working from ladders, an open drawer, etc. Risk: The risk is the chance, high or low, that somebody could be harmed by these and other hazards, together with an indication of how serious the harm could be. Safety engineering: It is an engineering discipline which assures that engineered systems provide acceptable levels of safety. Hazard Identification Study: It is the process of identifying hazards in order to plan for, avoid, or mitigate their impacts. Hazard identification is an important step in risk assessment and risk management. Risk assessment: It is the determination of quantitative or qualitative value of risk related to a concrete situation and a recognized threat (also called hazard). A risk assessment is simply a careful examination of what, in your work, could cause harm to people, so that you can weigh up whether you have taken enough precautions or should do more to prevent harm. Occupational safety and health (OSH): It is a cross-disciplinary area concerned with protecting the safety, health and welfare of people engaged in work or employment. The goals of occupational safety and health programs include to foster a safe and healthy work environment. Hazard analysis: It is used as the first step in a process used to assess risk. The result of a hazard analysis is the identification of different type of hazards. Now that you know some of the terms that are frequently encountered while approaching this topic, we can move on to the intricacies of it. Before anything, analysis is must, an assessment of a risk. How is it done? Follow the link to learn about the five steps to risk assessment. Any plant operation sometimes involve deviation from design parameters during the operation. HAZOP study is a structured methodology to identify all possible deviations of the process parameters namely temperature, pressure, composition, direction of flow etc, and all the consequences associated with each deviations. The deviation is also correlated to the safety interlocks, instrumentation and administrative procedure related to the operation. The output of HAZOP is a list of possible deviations, their causes, consequences, safety measures and additional safety measures required to avoid consequences. The Occupational Safety and Health Administration (OSHA) has written voluminous occupational safety and health standards and regulations that affect employers and employees in the United States. It is the employer’s legal responsibility to educate employees on all workplace safety standards and the hazards that their employees may face while on the job. Because different countries take different approaches to ensuring occupational safety and health, areas of occupational safety and health’s needs and focus also vary between countries and regions. Read more here. Everyone has the Right to Know, the chemicals they are working with, the environment they will be exposed to. This topic stretches miles. One can go on reading about safety and the laws surrounding it. Last but not the least, we should not forget that we are humans, imperfect, we make mistakes. So, considering this, one also has to study something known as Behavior-based safety. Read more here. Before looking at the strategies of making plants safer, lets us first see how it is traditionally done. The various measures for prevention and mitigation of major accidents may be thought of as lines of defence’ (LODs) or ‘layers of protection’ (LOPs). 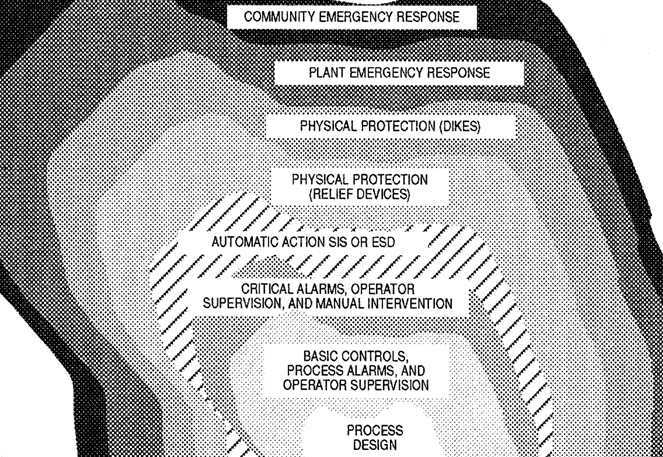 These lines or layers serve to either prevent an initiating event (such as loss of cooling or overcharging of a material to a reactor, for example) from developing into an incident (typically a release of a dangerous substance), or to mitigate the consequences of an incident once it occurs. This is illustrated in figure below. Read more about LOPA, here. Inherent: Eliminating the hazard by using materials and process conditions which are non-hazardous. It is the most reliable way. How about creating an atmospheric pressure reaction using non-volatile solvents. This way there is no potential for over pressure. Instead of using a corrosive substance like AlCl3 as a regent in huge quantities, we can use catalytic quantities of say, scandium triflate. A scientist, Shu Kobayashi, has researched a lot on Lewis acid catalysts like metal triflates, which are non-corrosive in nature, unlike the usual lewis acid catalysts. Passive: Minimizing the hazard by process equipment features which reduce either the probability or consequence of the hazard without active functioning. Designing a vessel for 4 atm when the operating condition is 1 atm or having equipment before or after the vessel to reduce the excess pressure. A reaction capable of generating 150 psig pressure in case of a runaway, in a vessel designed for 250, this way the reactor can contain the accident unless it is damaged. Active: Using controls, safety interlocks and emergency shutdown systems to detect and correct process deviations (engineering controls). A reaction capable of generating 150 psig in case of a runaway in a 15 psig reactor with a 5 psig interlock that stops feeds and a rupture disk to reduce pressure, directing contents to effluent treatment. What could happen? Procedural: Using operating procedures, administrative checks, emergency response, and other management approaches to prevent incidents, or to minimize the consequences (administrative controls). Consider the same 150 psig reaction, same reactor, without the interlock. The operator is instructed to monitor the pressure and shuts down feed. Mind you, there can be a human error to make it worse, hence it is the least preferred method. Substitute: Replace a material with a less hazardous substance. Do you remember? It is the same strategy we looked up to design safer chemicals. Next Next post: Go Planet!